Who inspired you recently? 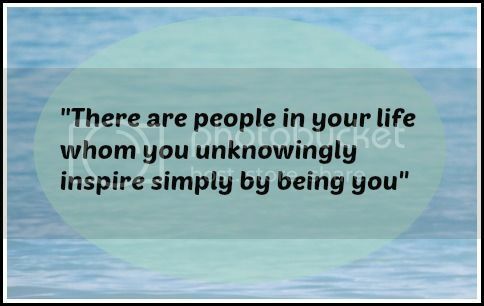 Who are those "simple" influential people in your every day life who might've left a much bigger impact than they could ever imagine? Lena you might not believe this but you are an inspirational woman in the way that you live your life without getting into debt. Another inspirational woman I once met is someone called Sue Hayward. She was a local woman (now living in Kenya) who set up a charity to look after children in Watamu. She has also set their own blog http://childrenofwchildrenofwatamu.blogspot.co.uk. It's worth a look just to read her story. I definitely will. I always admire people who can leave everything behind and go and serve others in different parts of the world with an open heart and arms. Oh, I'm so sorry about your Dad!! Is there any hope for him? Hugs to you, my dear. I know you are doing your best to help and support him right now. in a way I feel there is a lesson to be learnt from this! Right now, my inspiration is very much on my mind--my sister-in-law. She has just gone into hospice care for an incurable cancer. However, the way she has lived her life over the past year with determination and fun has been an inspiration to me and all who know her. I'm so sorry about your sister!!! Nothing hurts more than to see our loved ones suffer. AWESOME AWESOME post. Simplicity and determination are really the key to a great life. Thank you for the reminder! What a great story and a lesson to us all to listen to those who are around us. Right now my cousin is inspiring me - he has reached out to me and has been very supportive as I navigate my way through my recent difficulties. In times of difficulty you really find out who your friends are!